General Dynamics also received a $0.15-million Phase-A extension from NASA/Marshall to further study its shuttle concepts. The Triamese design was abandoned in September 1969 after more detailed analysis indicated that the development cost showed no considerable advantages vs. traditional two-stage systems. It had proven difficult to to have one aerodynamic shape serve both as booster and orbiter; too many compromises had to be made. The designers then tried to “stretch” the Triamese orbiter but this, in turn, reduced the design commonality and hence cost savings. The company finally settled for a similar "FR-3A" two-stage design (bottom left) with V-tails to provide hypersonic roll control and aerodynamic stability. The booster/orbiter staging point was at 56.7km altitude and 193 seconds after launch when the vehicles were flying at 3325 meters/second. The straight-sided bodies were designed to accommodate cylindrical propellant tanks efficiently. Variable geometry switch-blade wings would still be used for subsonic flight and landing only, so they would have to be optimized only for this part of the flight regime. The variable-geometry system would also have reduced the thermal protection system requirement on the wings (GD was the only company that still proposed a “hot structure” metallic TPS at the end of Phase A) and a very good crossrange capability, although it unfortunately also produced a high vehicle weight-to-planform ratio which in turn resulted in higher average base temperature relative to the straight- or delta-wing shuttles. 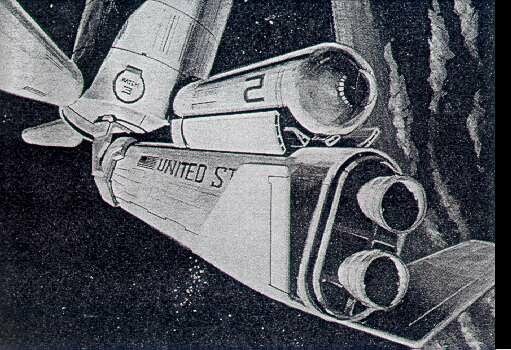 The additional weight and complexity of the swing-wing system was of some concern to NASA, who feared it would be costly to maintain and produce the required hardware. Payload capability to a 550km 55 deg. orbit: 22,680kg. Liftoff Thrust: 3,083,900 kgf. Total Mass: 2,557,880 kg. Core Diameter: 11.2 m. Total Length: 86.0 m.